The brilliant form of Cheteshwar Pujara continued in the second Test vs. England as the front line batting of India collapsed against the rival bowling. The strong batting line up of India struggled in their first innings of the second Test but an unbeaten 97 runs partnership between Pujara and Ashwin took them to a respectable total of 266 in 90 overs. 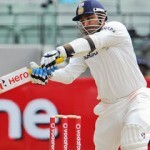 The second Test of the four match series commenced on Friday, November 23, 2012, at Wankhede Stadium, Mumbai. Earlier, MS Dhoni, the captain of India, won the toss, elected to bat first and sent in Gautam Gambhir along with Virender Sehwag who was appearing in his 100th Test. Gambhir was declared leg before wicket off James Anderson for just four runs on the second ball of the innings as the pride of India, young Cheteshwar Pujara, took guards in the centre. 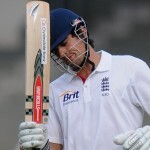 The two batsmen tried to settle down first, scored 18 runs in six overs and added nine in the next over with two fours. Sehwag hit a couple of fours in the 12th over but was clean bowled by Monty Panesar on the first ball of the 17th over for 30 as the total reached 52 runs. Sachin Tendulkar remained unimpressive and became the next victim for eight runs when his stumps were uprooted by Panesar. 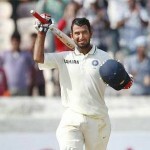 Virat Kohli joined in with Pujara who witnessed the dismissal of three top order batsmen from the other end. The latter continued with his stroke play, got two fours in the 22nd over and Kohli got his first boundary two overs later. Cheteshwar Pujara achieved his fifty on the last ball of the 35th over and the first hundred of the innings was also attained. Monty Panesar struck once again as Virat Kohli was dismissed for 19 runs when the score touched 118. The stumps of Yuvraj Singh were dislodged by Graeme Swann for a duck and the home side was in real trouble at 5-119 in 37 overs. MS Dhoni appeared on the scene and tried to force the English bowling with his traditional adventurous batting while Pujara remained watchful at his end. The pair enhanced the score to 169 as Dhoni was caught at gully by Swann off Panesar on the second delivery of the 62nd over for 29 with 4 fours. 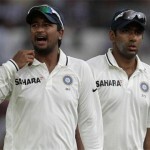 The young and courageous all-rounder, Ravichandran Ashwin, got together with the stranded Pujara. Ashwin opened his account with a four in the 67th over and added 10 runs in the next over with 2 fours. Pujara kept on creeping from the other end and the second hundred of the innings was illuminated on board on the first ball of the 70th over. The tiger of India, Cheteshwar Pujara, powered his third Test ton on the third delivery of the 81st over with a four and got an over whelming ovation from the crowd and his team mates. Ashwin took over the charge by dispatching 3 fours in the 83rd over off James Anderson with the new ball. He smashed his second Test fifty at a crucial stage on the first delivery of the 85th over with a four. India amassed a reasonable total of 266 by the close of play on the opening day mainly due to an unbroken 97 runs association between the two not out batsmen. 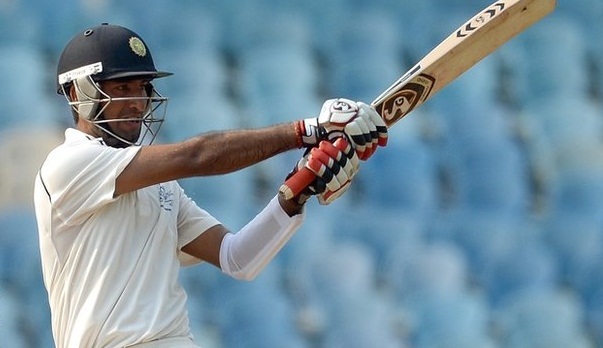 Cheteshwar Pujara was looking in good nick again at 114 off 279 with 10 fours and Ravichandran Ashwin secured his end with 60 from 84 balls with 9 fours. Monty Panesar was the most devastating bowler of England with four wickets whereas James Anderson and Graeme Swann got one wicket each. The addition of another 75-100 runs in the Indian score can bring them in a solid position on the wicket which is helping the spinners whereas England will anticipate ripping through the tail of the rival team at earliest on day three.